The Bank of Japan (BoJ) has pumped 6 trillion yen ($76bn; £47bn) into the country's financial markets in a bid to stabilise them. 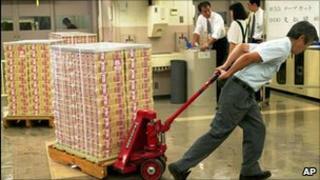 The move comes after the yen rose to its highest level against the US dollar since World War II. The yen climbed as high as 76.25 against the dollar on Wednesday. In Asia on Thursday, it fell to 79.42. The BoJ has now injected a total of 55.6tn yen into the markets after last Friday's earthquake and tsunami. The central bank is keen not only to ensure calm in the markets, but also to keep the value of its currency in check. To this end, it pumped 5tn yen into the markets on Thursday morning, before injecting a further 1tn yen in the afternoon. A stronger yen is detrimental for the export-dependent Japanese economy. It not only makes its goods more expensive but also hurts the profits of some of its biggest companies when the repatriate their foreign earnings back home. Meanwhile, the finance ministers of the G7 nations have called an emergency meeting to discuss the volatility in world markets and the impact of a stronger yen on the global economy.